So I went ahead and brought a stroller I have been looking for ages but was not sure what I wanted. One thing I did know I didn't want to spend alot of money! Mama and papas had a huge range of strollers and looking at the reviews of them they weren't what i expected for the price! so i looked on kiddicare.com where I brought Amis Pram, shes currently in the Obaby ZeZu in purple. we love this pram but it can be bulky and not everyone has an estate to cart it round! Im extremly accident prone as it is so have crashed into plenty door frames etc. kiddicare had a few but nothing I really fancied! 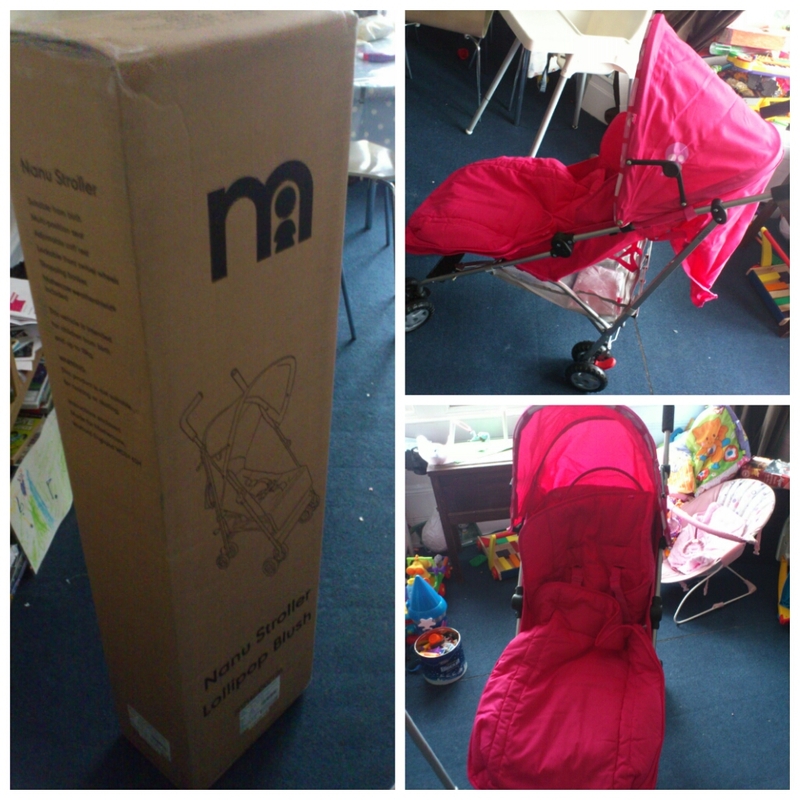 So i looked on mothercare where they had a stroller with £10 off the Mothercare Nanu Stroller - Lollipop Blush. I looked on Voucher code to see if i could get a further discount, and to my surprise there was a another £10 of if you spend £50 if you download the iphone app, so all in all got £20 of the original price! i do love a bargain me! with the £20 i brought a pink cosytoes! It came this morning easy to put together! don't usually go for pink but the husband loves pink! or anything girly for Ami he loves! We have used it a few times and have found that Ami has not liked it, maybe she enjoys parent facing Im not sure, we also found that she ends up slouched down in the pushchair. Also the cosytoes is more hastle than its worth so we havent used it! We carry on to use the pushchair as its alot lighter and handy to use when out and about. Pants enjoyed playing with the box he got in it and i stood him up he was stuck in there was very funny my husband then picked the box up and attempted to put it outside! I love to save money where possible these children come with a huge price tag!